The web of life is no game! Play a hungry spider and gobble those juicy grubs while avoiding a hive of angry bees! Eat as many larva as possible while dodging the bees that fly by and try to break your web. The first rule of real estate is location, location, LOCATION! That's why I decided to make my home inside this BEEHIVE, since bee larvae are my favourite food! Use the LEFT and RIGHT keys to move me back and forth in my web. Then, when you spot a tasty larva, hold down SPACE to climb down and grab it! Release SPACE to make me zip back up to the safety of my web. Watch out for those bees though! If they hit me or my strand of web, I'll FALL! If you want to play Web-spinner's Dinner games online you have come to the right place! 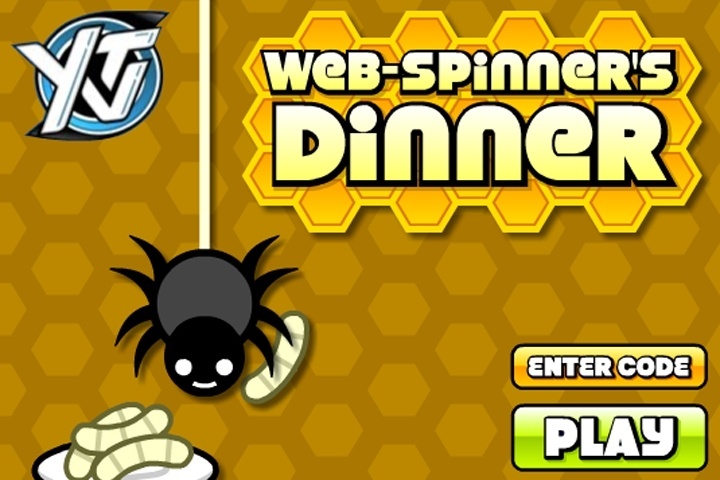 GamesLoon adds new Web-spinner's Dinner games every week. This is your game portal where you can find the biggest collection of free Web-spinner's Dinner games online. Do not forget to rate our Web-spinner's Dinner free online games while playing!